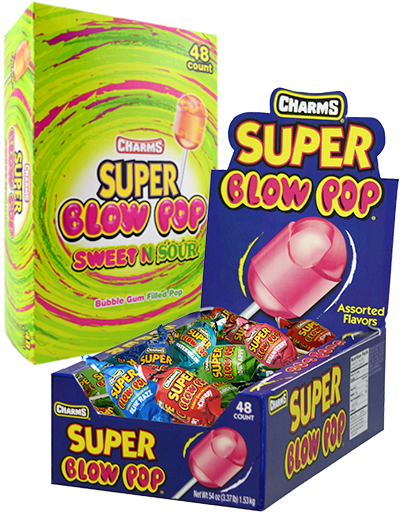 It's two lollipop treats in one with Charms Blow Pop, a chewy, bubble gum center surrounded by a delicious, fruit-flavored, hard candy shell. Available in a variety of great-tasting flavors that include traditional fruit varieties and more contemporary favorites - these pops are the world's most popular gum-filled lollipop. Charms Blow Pops just got bigger! If you like our original take on our two treats in one, you'll love these! Super Blow Pops come in 12 delicious flavors, you’ll have to try them all. Charms Sweet Pops are among the perfect, go anywhere treats for kids and adults. 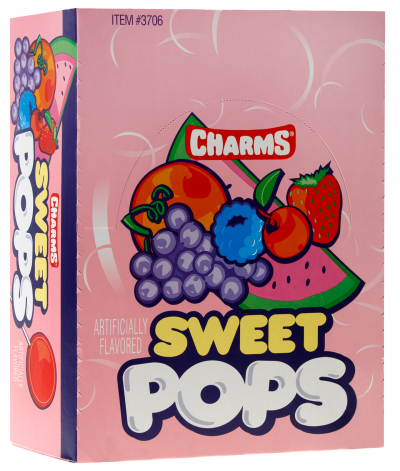 Charms Sweet Pops are a more traditional flat pop available in a variety of sweet fruit flavors. Charms Sweet and Sour Pops are a perfect, go anywhere treats for kids of all ages. 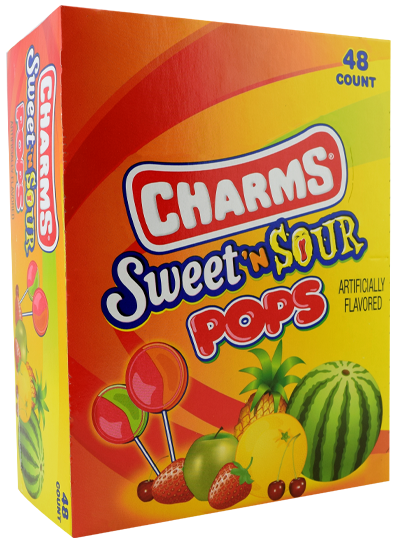 Charms Sweet and Sour Pops are flat, not rounded pop, and are available in a variety of sweet and sour fruit flavors. Love lollipops, but don't always have the time to finish one? Why not try the same big fruit flavors of a Charms Pop in an easier to finish size? Charms Mini Pops. Sold in value-priced bags in a variety of sizes, they're the perfect take-along hard candies, with 18-sweet tooth satisfying flavors. 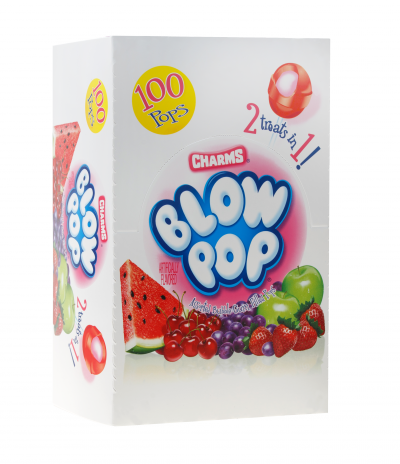 For on-the-go enjoyment of the same great taste and fun as Charms Blow Pops, Charms Blow Pop Minis are bite-sized assortments of four leading Charms Blow Pop flavors. They're the perfect go-anywhere treat - a Blow Pop without a stick! 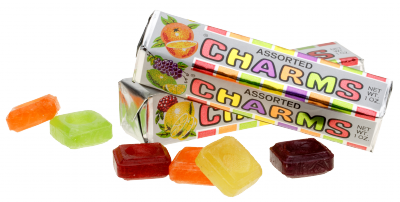 Charms Squares are the lollipop in square form with no stick required! They are the perfect combination of size and your favorite fruit flavors. Each assorted pack contains cherry, grape, lemon, lime, orange, and raspberry flavors. In 1988 Charms joined the Tootsie Roll family of products making Tootsie Roll the largest producer of lollipops in the world. 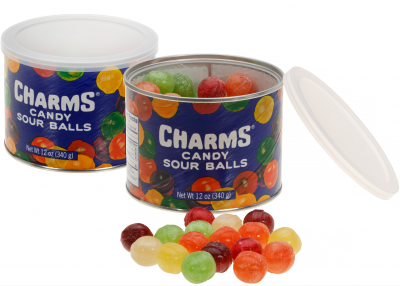 Charms Sour Balls are packed in a 'stay-fresh' resealable 12 oz. canister and holds about 65 pieces that includes Cherry, Grape, Lemon, Lime, Orange and Raspberry. Take them anywhere and everywhere!